PUMA has revealed a series of new white kits for Uruguay, Serbia and many more to be worn for the March international friendlies and at the 2018 World Cup in Russia. Dig in, and check out the new shirts. 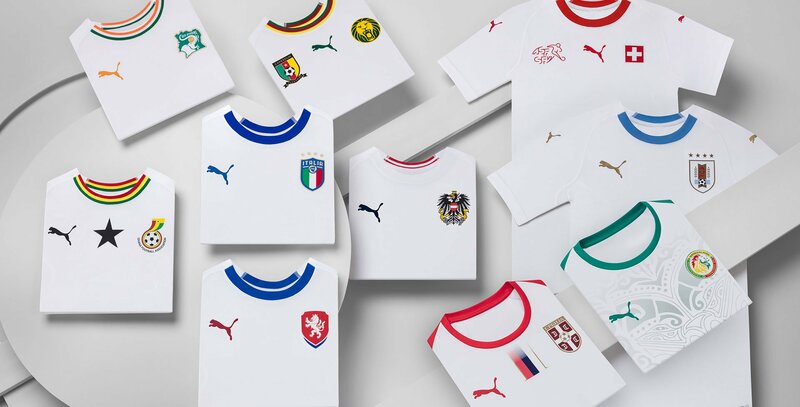 The 2018 FIFA World Cup is getting closer, and PUMA is ready with some beautiful white kits for both the brand's teams that have qualified and for those who haven't. In this summer’s big tournament, Switzerland, Uruguay, and PUMA’s latest acquisitions Senegal and Serbia will all pull on the white jerseys to play for the pride of their badge. There is no hiding from the gaze of the world, the lights of the stadium and the eyes of the opposition, now is the time to illuminate the game in immaculate style. Senegal will wear their white PUMA shirt as a home kit, while Switzerland, Serbia and Uruguay all will wear the clean shirts as away kits. Under one design language, PUMA has created a kit design story that is clean, stylish and contemporary. Each kit is distilled to the unique and core elements that represent each Federation; from the nine blue lines on the neck of the Uruguay shirt that represent the nine original departments of the nation to the red of the national flag on the collar of the Swiss Jersey. Unified by colour, each shirt celebrates the elementary design features of each Federation; be it badge, flag or iconography. Each design incorporates PUMA’s evoKNIT thermoregulation technology delivering enhanced moisture management and adaptive cooling system that helps create the perfect on-pitch body temperature. The clean white design highlights the engineered evoKNIT cooling fins and its seamless construction further pushes the boundaries of performance. Do you want to support one of PUMA's World Cup teams? Right here, you can already order the Uruguay and Switzerland kits, while the Serbia and Senegal kits are coming soon.